Third Base Politics: This is Kevin DeWine's kind of Republican. Let's kick her out of the ORP. This is Kevin DeWine's kind of Republican. Let's kick her out of the ORP. How would you describe someone who chose to stand with Ted Strickland over Ken Blackwell in 2006, and proudly displayed Strickland bumper stickers and signs on their vehicles and property? Would you call them a Republican? Hardly, right? Well, guess what? Such a person sits on the Ohio Republican Party State Committee. 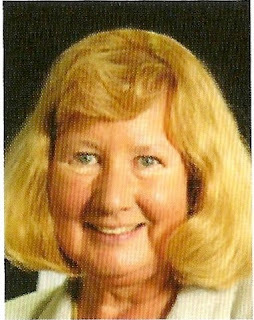 The person in question is Nancy Suhadolnik, wife of Gary Suhadolnik. Not only did Gary go to work for Strickland, he also speaks out frequently against Governor Kasich. And judging by how much money Kevin DeWine is spending to keep her in her seat, she is the most important person in the ORP. 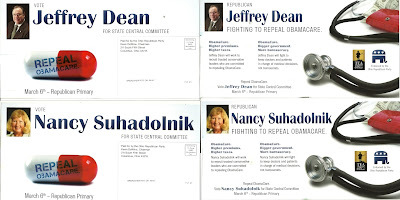 One family in Broadview Heights has now received TEN postcards and 10 robocalls promoting Nancy and the 24th district committeeman Jeff Dean, in just 2 weeks. Remember that TV and radio ad buy I referred to yesterday? That buy alone is enough to buy a new Mercedes. And a person inside the ORP has said that DeWine is willing to spend $100,000 just in Nancy's 24th district alone. Check out the first cards sent out. Nancy Suhadolnik is working with Governor Kasich? A complete lie. 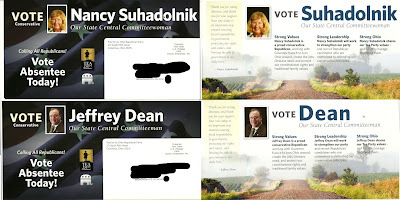 The Suhadolnik's have "Tea Party Values?" This is completely offensive. And the dirt road and farms? This is Cuyahoga County. Those don't exist there. Just a couple of days later, here come cards 3 and 4. Hey, according to cards 7 and 8, State Central Committee members can bring "new jobs and better opportunities." 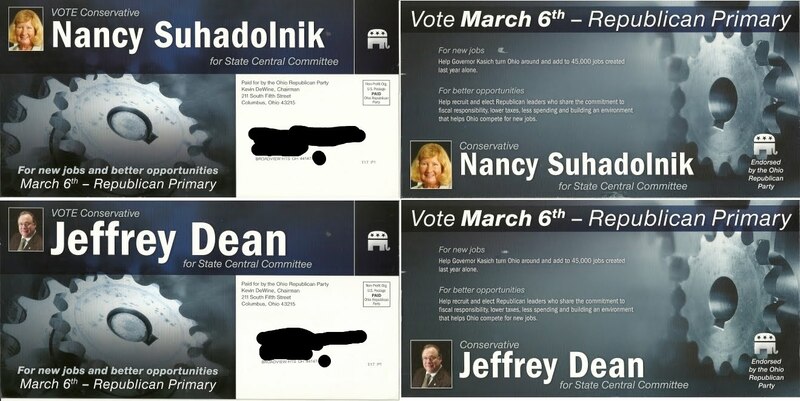 Yes, that's conservative Nancy Suhadolnik. 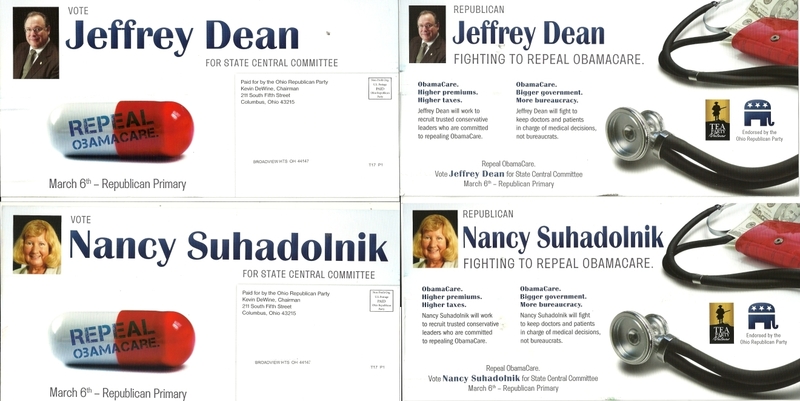 Because true conservatives supported Ted Strickland over Ken Blackwell. This is starting to make me sick. The issue was debated and there were many good points made on both sides. It was voted that this would be a secret ballot and that the votes would remain a secret. I'll let you draw your own conclusion. My opinion is that she voted for the amendment and doesn't have the guts to even stand by her decision. She is loyal to Kevin DeWine. Make no mistake about that. These candidates are for party committee seats. Unpaid positions that meet a few times a year. They aren't legislators. They dont vote on state laws or budgets. So...why in the world is Kevin DeWine spending up to $100,000 just in this district. Because they have the one power DeWine is interested in above all else. The vote to keep him as chairman or find someone else. Its more important to DeWine to spend that money keep his chairmanship, than it is to defeat Democrats. So, how do we get rid of Nancy and Jeff? By electing someone to the committee we can trust. If you live in the 24th district, please vote for Stephen L. Sabolich and Kim O'Malley. What is so special about Steve and Kim? Both of them are unabashed supporters of Govenor Kasich. Steve was one of the founders of the Westshore Tea Party, and a hard worker for Issue 2/SB5 and Issue 3/The Ohio Project. Kim was volunteer of the Year for the Cuyahoga County in 2010, and she was personally responsible for bringing Gov. Kasich to Independence Ohio in support of Issue 2 pre-election. They are true grassroots. They walk the walk, folks. Share this post with every GOP primary voter that you know, and ask them to keep forwarding it on. What do we get from Kevin DeWine and the ORP? They tell us the people they endorse for the committee are conservatives, when they aren't. They tell us the people they endorse for the committee have tea party values, when they don't. They tell us the people they endorse for the committee work with Governor Kasich, when they actually undermine and speak against him. They tell us the people they endorse for the committee are Republicans, when they supported Ted Strickland over Ken Blackwell. As long as Kevin DeWine is running the ORP, we can't trust our own party. If we can't trust our own party, Kevin DeWine must go. Thanks for finally exposing the issue for what it is. I am running for SCC in SD23 against Bob Bennett and have seen the same kinds of chicanery here as well. I have written no less than 3 emails to DeWine asking who authorized this spending AND how much have they spent. Guess what, he hasn't even replied. In 2010 I ran for the Ohio Senate in SD23 and spent just under $30K. None of that money came from the ORP. While I lost, I did so by less than 28 votes a precinct. Had DeWine and the ORP given me a fraction of what they spent in 2010 to keep incumbent SCC members I would probably have won. 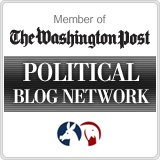 Thanks again for a great article detailing what is wrong with our Party and our Chairman. 1. I've received these mailers as well. Thankfully no phone calls. 2. I wonder if Nancy has the same relationship she had with the previous ORP chair. 3. @Dave Morris....lol. He got under 40% of the vote. No amount of money is going to get a social circuit candidate, who doesn't do the grassroots politics necessary, elected in a district that includes Lakewood, Brook Park, Cleveland, and Parma. And if he were a serious candidate, his troublesome work record while he was a Democrat working in Brook Park certainly would've become an issue. In short, if the ORP would've spent any money on his race, that woud've been cause for outrage. How can you please get this info out to the masses (ie editorial in/on local news etc)? We have sent the link to this story to everyone we know in our district--this is too important. Mainstream media wont care much about this. But it doesn't hurt to send it to editorial boards, write your own letters, etc. 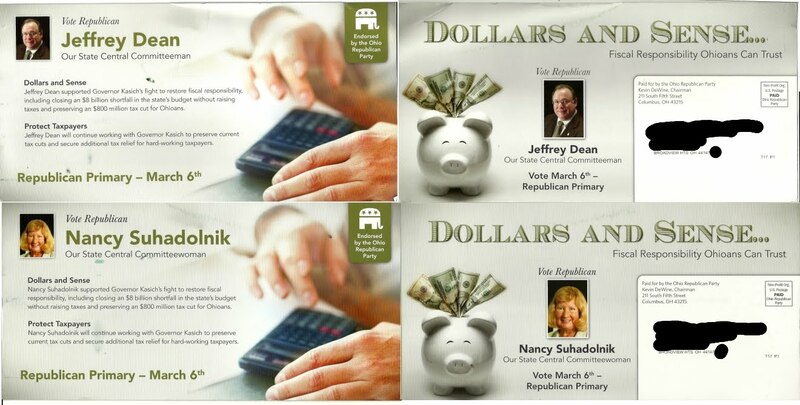 Thank you for posting the pics of the mailers--we too have noticed (on the mailers we have received--which is just about everyday now) that they say they are paid for by the "Ohio Republican Party"; Non-Profit Org. 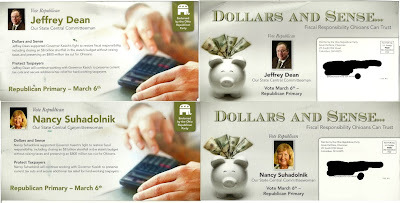 US Postage Paid Ohio Republican Party; not to mention the bogus "Tea Party Values" logo they are using as well! Sorry we had to post as "Anonymous" as we do not subscribe to any of the other options--we'd rather post as "Disgruntled Constituent"! Thanks for the great job of reporting--keep up the good work! So why are we fighting a civil war among good people that agree on about 90% of the issues? shouldn't we ALL be focused on getting the socialist out of the white house before he does more damage to our country? "So why are we fighting a civil war among good people that agree on about 90% of the issues? " Because the ORP and Kevin DeWine is spending millions of dollars against conservative Republicans to keep themselves in power instead of using it against the socialist. Yesterday in Rocky River Ohio, Herman Cain said that there were 6 million Republican voters who stayed home in 2008. In 2012, Kevin Dewine was NOT spending this much effort to make sure our party was inspired, motivated, or had the tools to tell they why being Republican is about prosperity and excelling, not a food stamp, welfare, or unemployment check. If we can't win in this economic environment, then Mr. Dewine deserves to be put in the trash bin of history. I am in the 19th District in Franklin County. This district is portions of northern Franklin County and all of Delaware and Knox Counties. 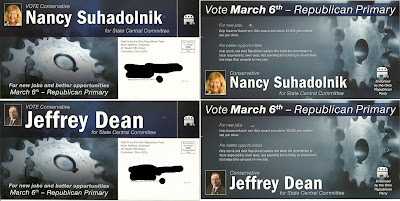 The last couple of weeks, I have been receiving mailers for Richard Cochran. It looks like he is from Knox County. His opponent is Steve Cuckler. I remember Steve from his time working for Larry Householder, which was eventful. Given Householder's (plus Buerck's) associations with DeWine, I would have to believe that Cuckler is the DeWine candidate. However, I have received nothing from Cuckler. So does anyone have the answer regarding this 19th district race? Which candidate is the DeWine candidate? My first time ever posting, so I'm a new "Anonymous." I've been wondering who to vote for between Cuckler and Cochran. Not a whole lot out there on either one. Looks like Cochran ran for the same position in 2008 and 2010. He was the Tea Party choice in 2010 (K. DeWine wanted somebody else in 2010 - Tea Party does not seem to be making recommendations this year). Cochran is a co-chair for Romney in Knox County. Cuckler gets the big name endorsements (Tiberi, Rinehart, Jim Hughes, Tom Zawistowski - all on the literature I got from Cuckler), but Kasich is conspicuous by his absence. Cuckler did work for Householder. Only other stuff I found was negative stuff. It took him three times to pass the Ohio bar examination. This became a big deal because he filled out some paperwork indicating he was a lawyer before he really was a lawyer. The Ohio Supreme Court reprimanded him in 2004. On Cuckler's mailer, he is making a big deal about Cochran's "undisclosed outside donors." IMO, Cuckler is the DeWine candidate but that does not make Cochran the Kasich candidate. I think Cuckler is grasping for straws by bringing up Cochran's undisclosed donors. Maybe these donors exist but I'm guessing I would not have a problem with their politics. The Columbus Dispatch website has a voter guide where you can line them up, side by side. Both answer a few questions. Wish I could find more about both. I know Steve Cuckler. I live in Delaware City. He used to be our councilman. Cuckler is NOT beholden to anybody. He is a US Army Veteran and Conservative. He believes that the best vehicle to make American more free, is the Republican Party. Accordingly, he wants to make sure that the Ohio Republican Party remains rooted in freedom and liberty. He has been fighting for conservative and libertarian issues 20 years before there was a Tea Party. People like him help planted the tea seeds, so that we could harvest it in 2010 and God Willing in 2012.